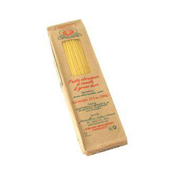 Rustichella d'Abruzzo has been crafting the finest artisan pastas since the early 1900's. Their spaghetti is the standard in Neopolitan kitchens. Since the early 1900's, Rustichella d'Abruzzo pastas have been crafted from two simple ingredients: stone ground durum wheat and pure spring water. The pasta is air dried for a crucial 56 hours, which creates a dense, flavorful pasta that cooks perfectly al dente. The most famous cut of pasta, spaghetti, literally means "lengths of cord". Versatile enough to be used in any kind of dish, it can also be used with most any sauce. Rustichella d'Abruzzo Spaghetti is far superior to other mass produced brands. One taste and you'll appreciate the superior quality of this artisan produced pasta. Gianluigi Peduzzi insists on using the time honored techniques that his grandfather perfected in the early 1900's when crafting every cut of Rustichella d'Abruzzo pasta. The magic begins with two ingredients: stone ground durum wheat from hard winter wheat and pure spring water from the Abruzzo mountains. The dough is extruded through hand carved bronze dies, some of which date from the 19th century, resulting in rustic textures that hold sauces beautifully - much better than with mass produced pasta. The Rustichella d'Abruzzo facility is located in the heart of the Abruzzo region of Italy, long known for its pasta culture. Abruzzo is dotted with lush green hills and golden swaying wheat. It is here where the artisanal practices allow for careful monitoring of quality in every step of pasta production and the Rustichella d'Abruzzo tradition flourishes. Rustichella d'Abruzzo pasta is air dried for a crucial 56 hours in specially designed rooms which emulate the warm breezes of Abruzzo. The final result is pasta that cooks to a perfect al dente stage with a great depth of flavor. Gianluigi's artisan basis of production means that Rustichella d'Abruzzo creates in one year what commercial pasta producers make in one day. The pasta has the deep golden color of the wheat fields and a slightly rough surface. The handmade shapes bear the symbols of years of experienced kneading and shaping, the sign of true quality. To ensure the authenticity of unique regional pasta shapes, Gianluigi collaborates with friends who are small pasta producers throughout Italy.